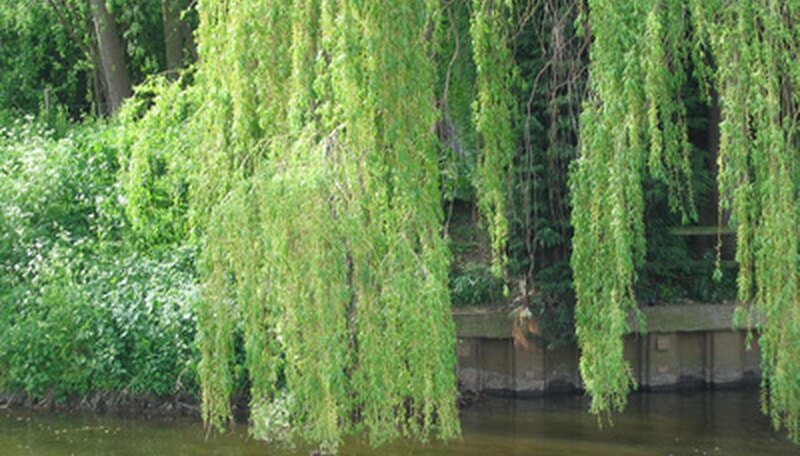 Weeping willows are large, graceful trees that are prone to numerous diseases, pests and other problems. They have extensive root systems that can grow into water and sewer pipes, septic tanks and drain fields, as well as dislodge sidewalks and driveways. The wood is brittle and often breaks. Weeping willows grow in zones 6 to 9 in evenly moist soil and full sun. Regular irrigation and fertilization helps weeping willows to stay healthy and resist diseases. Removing infected plant material from the trees and surrounding areas helps to prevent the spread of diseases. Two fungi, Venturia saliciperda and Glomerella miyabeana, work together to cause willow scab and willow blight. Olive green to black spores grow on the undersides of infected leaves. The foliage withers and quickly dies. The infection then invades the adjacent stems and causes twig dieback and cankers. Bordeaux mixture can be applied following the manufacturer’s directions to control willow scab and willow blight. Numerous fungi cause minor leaf spots, such as tar spot, on weeping willows. The spots may be brown, purplish-red or black and usually do not require any treatment. Rust causes yellow spots on the undersides of the leaves. Chemical control usually is not needed, although severe cases can result in defoliation of the affected tree. Other fungi cause cankers, areas of dead bark, on the trunks or limbs of infected trees. Cankers can girdle limbs and cause their death. Limbs with cankers should be pruned out and destroyed. If cankers girdle the trunk of a tree, the entire tree will decline and die. Chemical treatments usually are not effective on weeping willow tree cankers. Powdery mildew is a fungal disease that attacks the foliage and stems of weeping willow. Patches of white powder cover the affected parts and may cause defoliation. Apply a fungicide according to the manufacturer’s directions to prevent and control powdery mildew. Crown galls caused by fungi form on the trunks of weeping willows at or just above the soil line. The tree should be removed and destroyed, and the areas should not be replanted for at least two years. University of Florida: Salix spp.